Experience the benefits of Cryotherapy at half off the normal rate. Call or fill out the form at the bottom of this page to make an appointment. Universal Chiropractic was first in Western New York to offer affordable state-of-the-art Spinal Decompression for those with neck and low back pain, making treatment more accessible to more people. Now, Dr. Z’s mission to bring patients the latest technology in health care continues today with the addition of the Universal Cyotherapy Cryosauna. Cryosaunas have been used in Europe for decades and in recent years have made their way to California and Texas, mainly for professional athletes and the rich and famous. Individuals suffering from chronic pain brought about from conditions like rheumatoid arthritis or fibromyalgia, or even those just looking to improve their overall health and well-being benefit from this therapy. The concept of cooling the body to relieve inflammation is not new. Ice packs and ice baths are commonly used. Cryotherapy however, and specifically the Cryosauna, is relatively new, and because the chamber temperature is -120 to -160 degrees C, the treatments are faster, (2-3 minutes) and most people say it’s much more pleasant experience than dealing with the hassle of ice packs or getting wet! You may be wondering, what actually happens when we “freeze” the body, and why it helps. In a nutshell, we’re promoting healthy, natural cellular activity. The shock of the intense cold triggers a natural response in your body, sending your blood to your core, protecting your vital organs. Remember, your body doesn’t know that you’re really going to step out of the chamber in two minutes! So it thinks it has to keep you alive! When the blood is rushed to the core, it’s also enriched with oxygen, red blood cells, and hormones. Once you step out and begin to warm, that enriched blood rushes throughout your system, benefiting every part of you on cellular level! Even athletes and weekend warriors will notice improvement in their function. 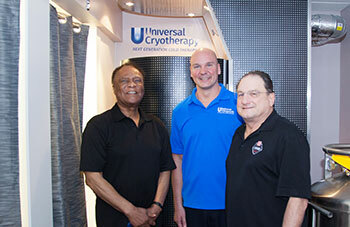 With Universal Chiropractic’s affordable rates, everyone will be able to benefit from Cryotherapy!